It’s nearing the end of third period in sixth grade teacher Tracey Pennington’s class at Daybreak Middle School, and the excitement in the room is palpable. The students are practically bouncing in their seats waiting for the bell to ring. As soon as it does, the classroom empties in a flash as the students quickly line up before heading on their way downstairs to take part in the school’s peer mentoring program. 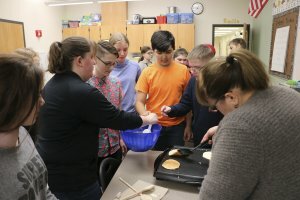 Today, this group of mentors is helping prepare and make pancakes alongside their “buddies” in special education teacher Kristina Heikes’ class. Other days, the mentors might be helping their buddies with school work, creating arts and crafts, playing games, or just socializing and having fun getting to know more about each other. This is the first year of Daybreak’s Peer Mentoring program, and Pennington says the early results have been a smashing success. Tracey Pennington is now in her second year teaching at Daybreak Middle. She left the teaching profession for several years in 2011 after becoming a certified nursing assistant and soon started working with adults and kids with special needs through programs at the Firstenburg and Marshall community centers in Vancouver. 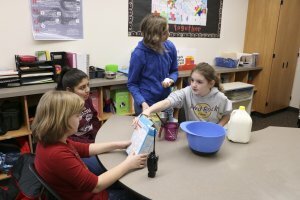 The inspiration for the program originated last school year when Pennington decided that one of the classroom “jobs” she’d assign to her students would be to visit the special education classroom for the last 15 minutes of one class period each day to hang out, play games, and lend a helping hand when needed. Students rotated classroom jobs each week, and everyone was expected to perform each job at some point during the school year. “I expected there to be some hesitation and trepidation, but what happened was kids were bouncing out of their seats to go spend time with their buddies each day. If the student with that job for the week was absent, virtually every kid in my class would beg to take their place,” Pennington said. At the end of last school year, Pennington was asked what she wanted to teach for enrichment for 2018-19. That’s when the light bulb came on. With approval from school administrators, Pennington approached special education teachers Kristina Heikes and Jeanie Vashaw with the idea of combining their fourth period classes and calling it Peer Mentoring. They enthusiastically signed on to the idea, and the program was born.